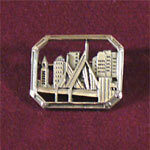 Our Zakim Bridge charm is crafted in the USA of Sterling silver. The Leonard P. Zakim Bunker Hill Bridge, part of The Big Dig Project in Boston, is the widest cable-stayed bridge in the world and serves as the northern entrance to and exit from Boston. The Bridge is named after civil rights activist Lenny Zakim and the American colonists who fought the British in the Battle of Bunker Hill.